David Thom presents Jimmy Martin Night! David Thom has rounded up the best in California bluegrass for this evening of traditional bluegrass classics, featuring songs from the King of Bluegrass, Jimmy Martin and his Sunny Mountain Boys. With Annie Staninec on fiddle, Butch Waller on mandolin, Joe Kyle, Jr. on bass, Larry Cohea on banjo, Mike Witcher on dobro, David on guitar, and the James King Band this is a group that can do justice to a king! 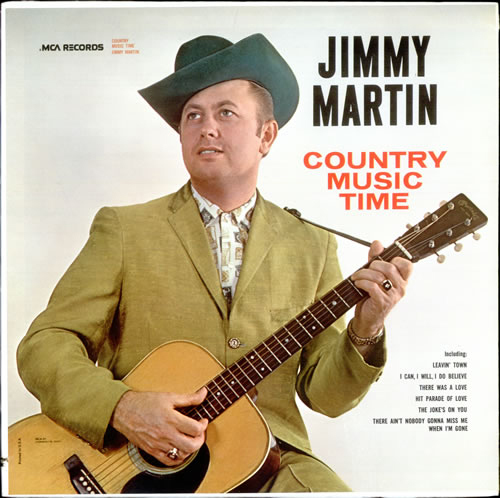 Jimmy Martin of Sneedville, Tennessee grew up singing in church and with friends from surrounding farms, bought a guitar when he was a teenager, and taught himself how to play while listening to legends like Lester Flatt and Charlie Monroe on the radio. In 1949, he became one of Bill Monroe’s “Bluegrass Boys” and in 1955 he started his own band, the Sunny Mountain Boys. He made his mark with songs like “Sitting Alone in the Moonlight,” “Memories of Mother and Dad,” “I’m Blue, I’m Lonesome,” “Red Rooster,” “Widow Maker,” and “Stepping Stones.” In 1971, he performed on the Nitty Gritty Dirt Band’s classic album, Will the Circle Be Unbroken. David and his bandmates have too many credits to list. Let’s just say that if you recruited the greats for a Bay Area version of Will the Circle Be Unbroken, all these folks would be sitting in the middle, making music for the ages.